Mexicans are by far the largest Hispanic-origin population in the U.S., accounting for nearly two-thirds (64%) of the U.S. Hispanic population in 2012.1 Hispanics of Mexican origin are also a significant portion of the U.S. population, accounting for 11% overall. Prior to the 1980s, most of the growth in the nation’s Mexican-origin population came from Hispanics of Mexican origin born in the U.S. However, since the 1980s—a decade after the current wave of Mexican migration took off—and up until 2000, more growth in the Mexican-origin population in the U.S. could be attributed to the arrival of Mexican immigrants. In the decade from 2000 to 2010, that pattern reversed—births surpassed immigration as the main driver of the dynamic growth in the U.S. Mexican-origin population (Pew Hispanic Center, 2011). 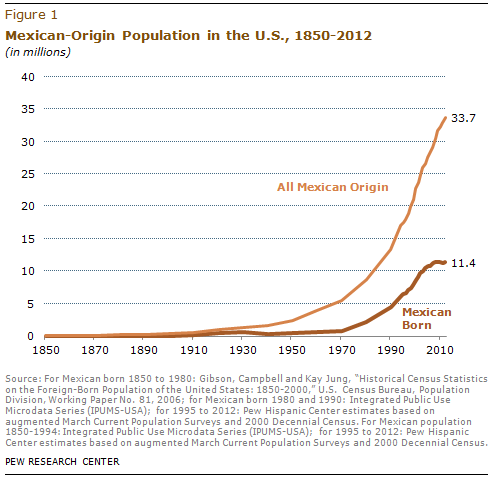 Mexican immigration has also played a large role in shaping the nation’s immigrant population. Today, 11.4 million Mexican immigrants live in the U.S., making them the single largest country of origin group by far among the nation’s 40 million immigrants. The next largest foreign-born population, from greater China at 2 million,2 is less than one-fifth the size of the Mexican-born population in the U.S. In addition, Mexican migration has shaped the nation’s unauthorized immigrant population. More than half (55%) of the 11.1 million immigrants who are in the country illegally are from Mexico. Among Mexican immigrants, half (51%) are in the U.S. illegally while about a third are legal permanent residents (32%) and 16% are naturalized U.S. citizens. Overall, naturalization rates among Mexican immigrants who are in the country legally are just half that of legal immigrants from all other countries combined (Gonzalez-Barrera et al., 2013). The characteristics of Mexican immigrants have changed over the decades. Compared with 1990, Mexican immigrants in 2011 were less likely to be male (53% vs. 55%), considerably older (median age of 38 vs. 29), better educated (41% with high school or more vs. 25%), and have been in the U.S. for longer (71% had been in the U.S. for more than 10 years, compared with 50%). On economic measures, Mexican immigrants have mixed results. Although median personal earnings increased by about $2,000 during the last two decades, the median household income of Mexican immigrants suffered a drop of more than $4,500. This reflects the effects of the recent economic recession that drove up unemployment rates in the nation, particularly among Mexican immigrants. Immigration status. 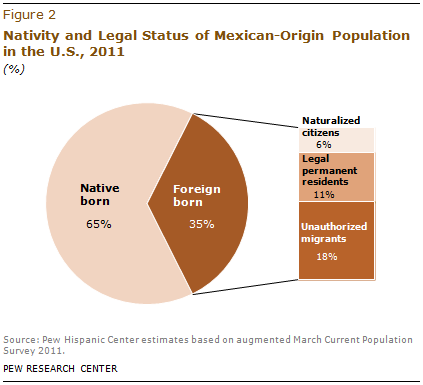 Almost two-thirds of Mexicans in the U.S. are native born (65%). About two-thirds of immigrants from Mexico (65%) arrived in the U.S. in 1990 or later. Language. Two-thirds (66%) of Mexican-origin Hispanics ages 5 and older speak English proficiently.5 The remaining 34% report speaking English less than very well, equal to the share among all Hispanics. About nine-in-ten (89%) native-born Mexicans ages 5 and older speak English proficiently. This compares to about one-in-three (29%) among Mexican immigrants. Age. Mexican-origin Hispanics are younger than both the U.S. population and Hispanics overall. 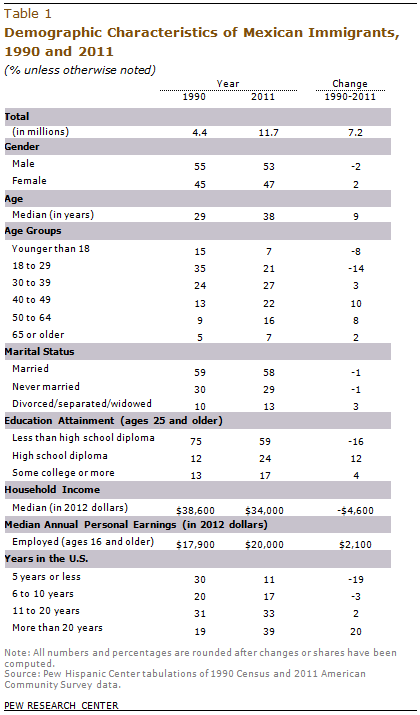 The median age of Mexicans is 25; the median ages of the U.S. population and all Hispanics are 37 and 27, respectively. U.S.-born Mexicans are considerably younger than their foreign-born counterparts. The median age of native-born Mexicans is 17, compared with 38 of the foreign born. Marital status. Among those ages 15 and older, Mexican immigrants are more likely than native-born Mexicans to be married—58% vs. 34% respectively. As a group, Mexican-origin Hispanics ages 15 and older are slightly more likely (45%) to be married than Hispanics overall (43%). Regional dispersion. More than half (52%) of Mexican-origin Hispanics live in the West, mostly in California (36%), and another 35% live in the South, mostly in Texas (26%). There is no significant difference in the regional dispersion of Mexicans by nativity. Educational attainment. Mexicans have lower levels of education than the Hispanic population overall. Some 10% of Mexicans ages 25 and older—compared with 13% of all U.S. Hispanics—have obtained at least a bachelor’s degree. Mexicans born in the U.S. are almost three times more likely to have earned a bachelor’s degree than those born in Mexico—15% vs. 6% respectively. About six-in-ten Mexican immigrants have not earned a high school diploma (59%), compared with 21% of Mexicans born in the U.S.
Income. The median annual personal earnings for Hispanics of Mexican origin ages 16 and older was $20,000 in the year prior to the survey, the same as for U.S. Hispanics overall. U.S.-born Mexicans had higher earnings than their immigrant counterparts—a median of $22,000 vs. $19,000 respectively. Poverty status. The share of Mexicans who live in poverty, 27%, is slightly higher than the rate for Hispanics overall (25%). U.S.-born Mexicans are slightly less likely to live in poverty than their foreign-born counterparts—26% vs. 29% respectively. Health insurance. One-third of Mexicans (33%) do not have health insurance, compared with 30% of all Hispanics. 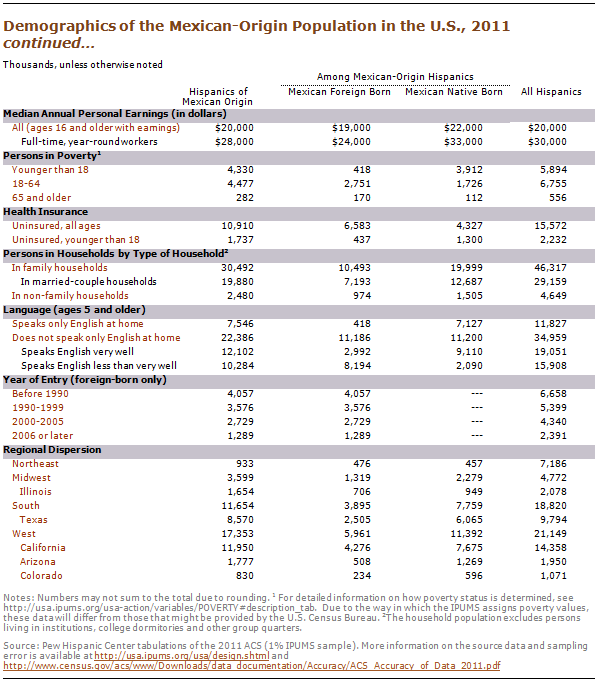 More than half (57%) of Mexican immigrants are uninsured, compared with 20% of those born in the U.S.
Homeownership. The rate of homeownership (49%) among Mexican-origin Hispanics is higher than the rate for all Hispanics (46%). The rate of homeownership among U.S.-born Mexicans (53%) is higher than that of Mexican immigrants (45%). This report examines the Hispanic population of Mexican origin in the United States by its nativity. Several data sources were used to compile the statistics shown in this report. The data for the demographic portrait tables are derived from the 2011 American Community Survey (1% IPUMS), which provides detailed geographic, demographic and economic characteristics for each group. Historical trends for the Mexican-origin and Mexican foreign-born population are based on the U.S. Census Bureau’s Current Population Survey (CPS) March Annual Social and Economic Supplement conducted for 1995 to 2012 and U.S. censuses from 1850 to 2010. Estimates of the unauthorized population are based on augmented data from the March supplement of the CPS. This report was written by Ana Gonzalez-Barrera, research associate, and Mark Hugo Lopez, associate director. Paul Taylor provided comments and editorial guidance. Jeffrey Passel provided guidance on the report’s statistical analysis. Anna Brown number-checked the report. Molly Rohal was the copy editor. “Legal permanent resident,” “legal permanent resident alien,” “legal immigrant” and “authorized migrant” refer to a citizen of another country who has been granted a visa that allows work and permanent residence in the U.S. For the analyses in this report, legal permanent residents include persons admitted as refugees or granted asylum. “Naturalized citizen” refers to a legal permanent resident who has fulfilled the length of stay and other requirements to become a U.S. citizen and who has taken the oath of citizenship. “Unauthorized migrant” refers to a citizen of another country who lives in the U.S. without a currently valid visa. “Eligible immigrant” in this report, refers to a legal permanent resident who meets the length of stay qualifications to file a petition to become a citizen but has not yet naturalized. “Legal temporary migrant” refers to a citizen of another country who has been granted a temporary visa that may or may not allow work and temporary residence in the U.S.